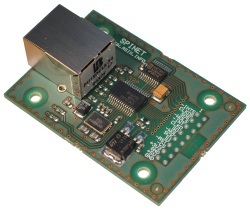 SPINET is a module based on ENC28J60 Ethernet controller by Microchip. It provides easy connection of any microcontroller like Microchip PIC or Atmel AVR to an Ethernet network. SPINET contains 10BASE-T physical layer (PHY) including RJ45 connector with galvanic insulation and media access control logic (MAC). 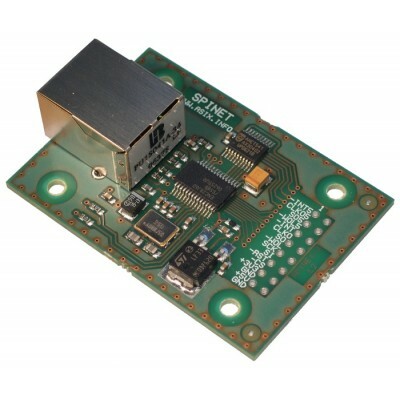 The heart of SPINET - the ENC28J60 chip - is an IEEE 802.3 compliant stand-alone Ethernet controller. It supports half duplex and full duplex operation at 10 Mb/s and it is equipped by 8 KB of dual port SRAM for incoming and outgoing data. Besides of other features it includes hardware engine for copying blocks of memory and checksum calculation in one's complement arithmetics (IP checksum) and CRC. 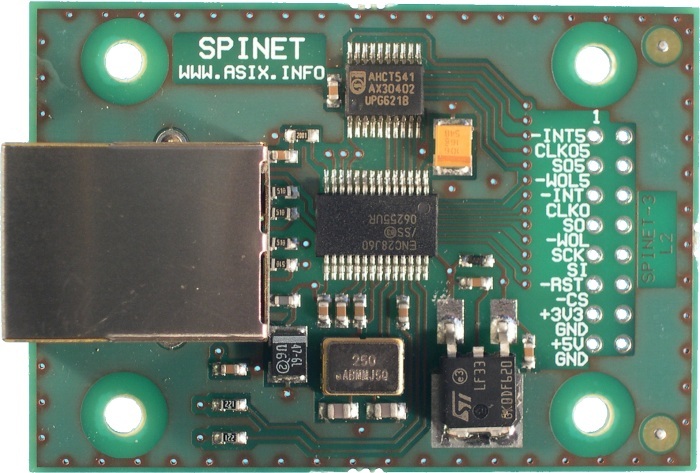 It connects to an external microcontroller by SPI interface which can be easily implemented in any microcontroller and requires only 4 or 5 signals. The module is powered by single power supply - either +3.3 V or +5 V. All module inputs are LVTTL and are 5 V tolerant. 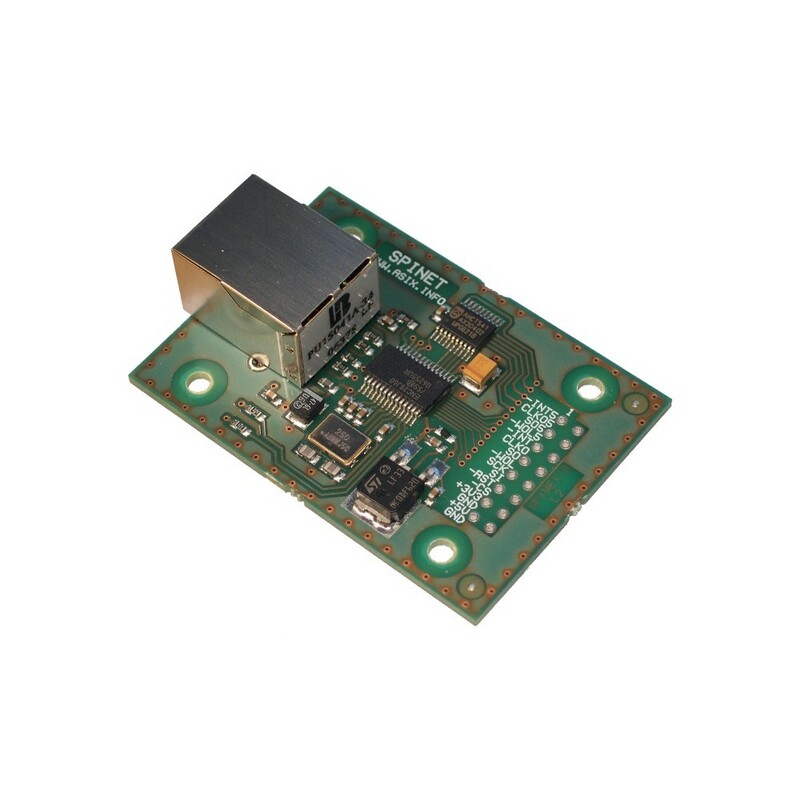 All outputs are doubled - they are available in 3.3 V levels (connected directly to ENC28J60) and, if 5 V power supply is used, also in 5 V levels. This is necessary for AVR microcontrollers operated on 5 V which have CMOS input levels and cannot reliably work with 3.3 V signals. Two LED indicators on the RJ45 connector help user to monitor the Ethernet activity. Four mounting holes allow for firm mechanical fixation of the SPINET module in user's equipment. SPI interface is connected to the open holes which allow for flexible connection of the cable or 2.54 mm/0.1 inch header (top/bottom, straight/right angle). An example program in C is available royalty free. 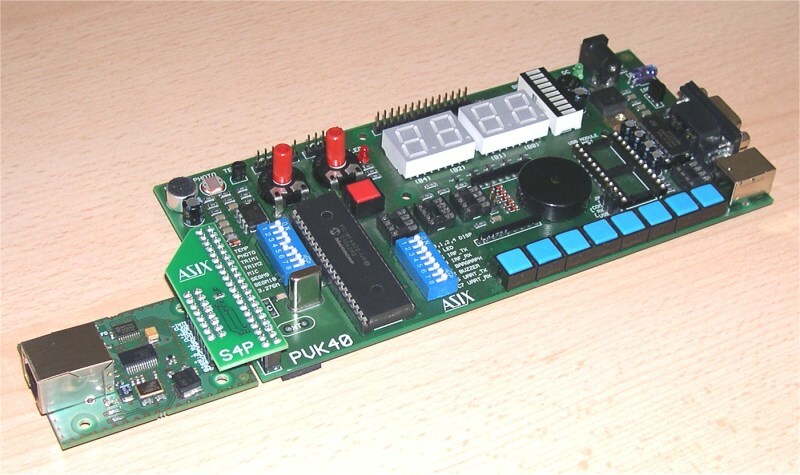 It is written for the PVK40 development board (optional accessory SPINET4PVK recommended) with PIC18F458 but this can be easily modified for other microcontrollers.